Young earth creationists say that the "Stone Age" in Africa lasted less than 500 years. However, a survey of the African landscape shows that there are 15 to 150 trillion stone tools, requiring hundreds of thousands of years (minimum) to produce. Did God plant all those tools to trick us into believing they had been produced over millennia? Trillions of stone artifacts cover the surface of the African continent. The product of the manufacturing of stone tools by hunters and gathers over long periods of time, these stone artifacts literally carpet the ground in some places in Egypt and Libya. Just how much Stone-Age produced rock could be strewn across the African continent? Imagine a volume of rock equivalent to 42-84 million Great Pyramids of Giza. The �million� isn�t a typo. That number sounds absolutely fantastic, doesn�t it? Let�s take a look at how these numbers were derived. The results of a study just published (see references below) shows how incredibly dense stone artifacts can be in some places in Africa. Working in a remote location in southern Libya, researchers took surveys from hundreds of one or two-meter square plots. From the tens of thousands of artifacts found in them, they estimated a minimum density of 250,000 stone artifacts per square kilometer is present in this portion of Libya. And this only included what was visible on the surface. Figure C of the supplemental material from the paper by Foley RA, Lahr MM (2015) Lithic Landscapes: Early Human Impact from Stone Tool Production on the Central Saharan Environment. PLoS ONE 10(3): e0116482. doi: 10.1371/journal.pone.0116482. This shows the rocky landscape of southern Libya and the artifacts that are found in high abundance. The researchers surveyed other published estimates of stone-tool densities in other areas of Africa. For example, some parts of the Nubian Desert average 12 million artifacts per square kilometer. They also calculate expected stone production given certain assumptions about population size and stone tool use over time. Overall, the researchers estimate that stone tool production across the entire continent of Africa has resulted in an average of 500,000 to 5,000,000 artifacts per square kilometer. Africa is roughly 30 million square kilometers in area, so that would put the total number of stone artifacts between 15 and 150 trillion. Yes, that is trillion with a T�an astounding number. "Taking the maximum figures, this yields � 2.1 x 10 14 cubic meters of rock. This is the equivalent of 84 million Great Pyramids of Giza� or 42 million taking into account the uneven hominid occupation suggested above. To extend the comparison further, it would be the equivalent of finding between 1.2 and 2.7 Great Pyramids per square kilometer throughout Africa." 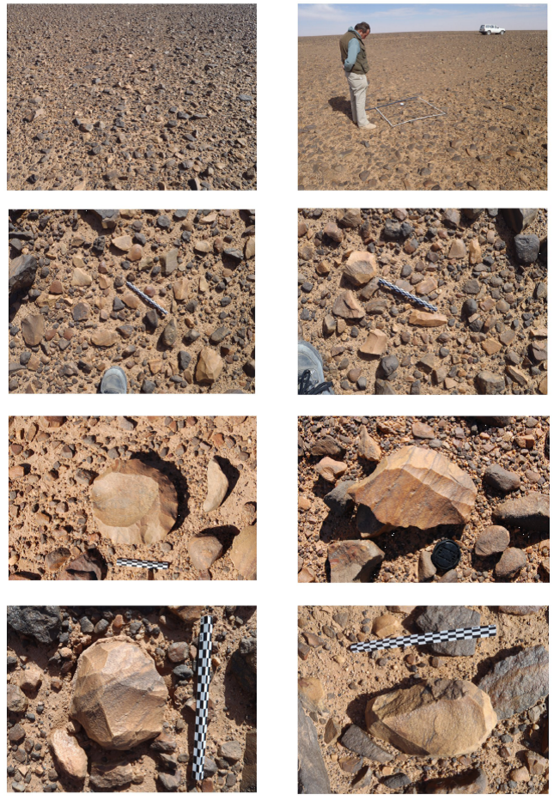 Lithic Landscapes: Early Human Impact from Stone Tool Production on the Central Saharan Environment. A few months ago I wrote (How Rare Are Stone Age Artifacts? A Visit to a Stone Tool-Making Factory in South America) about a dense stone artifact site in South Africa and stated that in just a few acres there had to be billions upon billions of artifacts. As well, in South America alone, there must be hundreds of billions of artifacts. But this new analysis shows that my estimates were far too conservative. If young-earth creationism (YEC) weren�t already mortally wounded by the abundant evidence from the observed world and careful exegesis of Scripture itself, these trillions of stone artifacts from the Stone-Age tool industry would certainly be the dagger to the heart. I will save a full-blown analysis of the damage to the young-earth hypothesis that this finding causes for another time. For now, let�s just hit the highlights. The standard young-earth view holds that the �stone age� was a short period of just a few hundred years in length (500 being the absolute max). This period spans from the time when families spread out from Babel 4250 years ago to about the time of Abraham. Ice-age timeline showing also where stone-tool making is expected in the young earth timeline. This is a typical timeline presented by Answers in Genesis and ICR. Let us be generous and give the YEC hypothesis 500 years for the Stone Age. I have done a few back-of-the-envelope calculations to see how the young-earth hypothesis fits the data about the stone-age tools in Africa, as presented above. Time span of 500 years. Now for the calculation: 20 generations x 100,000 people gives us 2 million people who produced stone tools. If each person produced 10,000 artifacts during his or her lifetime then this would result in 20 billion total artifacts, or 40 million artifacts generated per year. Now, 20 billion artifacts in 500 years is a lot, but it is definitely nowhere close to the 15 to 150 trillion artifacts estimated to be in Africa alone. At 40 million artifacts per year, it would take a population of 100,000 individuals 100,000 years to produce just 4 trillion artifacts. Modern science has determined that the Stone Age lasted as long as 2 million years. Assuming relatively small populations during that time span, this is about the time needed to produce the quantity of artifacts that we observe and estimate today. Yet here is what the YECs assume. A small band of people left Babel in 2250, migrated to Africa, forgot all the technology they once had in Mesopotamia, learned how to fashion rock into tools (this is a technology itself), extracted 40 million pyramid�s worth of rock from all over Africa, and fashioned that rock into countless numbers of stone tools in 150-500 years? Some YEC will doubtless claim that a group of 1000 people leaving Babel could have grown into a population of millions within 500 years and thus they could have produced several hundred billion artifacts. This still doesn�t get one to the observed numbers and that population growth would be unrealistic given the very difficult life of a nomad especially competing with lions and hyenas with only stone tools. And, remember, we are not even considering the billions of stone tools that exist outside of African in Asian and the Americas. Presumably people made their way to the Americas not long (10s of years maybe in the YEC timeline) after they came to Africa and yet the volume of stone tools in North America is a tiny fraction of what is observed in Africa. Anyway, this group of migrants from Babel would have been small in number at first, and so it is not even reasonable to think they would have grown to 100,000 individuals by 2000 BC when they settled into an agricultural lifestyle and no longer needed to fashion stone implements. My estimate of 20 billion artifacts is incredibly generous, and yet it leaves the YECs exceedingly short of explaining the vast numbers of stone tools that are so easily observed. Naturalis Historia is the collective works and thoughts of Joel Duff, a professor of biology at the University of Akron, who has spent many years discussing and writing about the intersection of science and faith. one of most devastating pieces of evidence against the young-earth hypothesis that I have encountered. Until I started looking at reports of stone artifacts in Africa I had no idea that stone tools were so ubiquitous. We see them in museums and tend to think they are very rare. Young Earth Creationists believe that the their interpretation of the Bible provides the best way to understand observations from geology, biology, astronomy and anthropology. However, these stone artifacts provide yet another example of where the YEC model for interpreting what we observe in the world around has provided a woefully inadequate explanatory framework. No doubt, trillions of artifacts raises difficult questions for all Christians as they seek to understand the anthropological message in scriptures. Young earth creationism seeks to provide a safe haven for escaping those questions but the safety it seeks for its followers is only an illusion which is why so many are apt to become disillusioned over time when they are confronted with the overwhelming evidence of their failed paradigm. Reasons to Believe, BioLogos, and countless other organizations and Christian scholars have wrestled with data such as these artifacts and produced explanatory frameworks for understanding both the Biblical and physical evidence. These ideas continue to be tested today by scientists and theologians. That such explanations are even possible should be evidence in itself that the young earth viewpoint is inadequate. 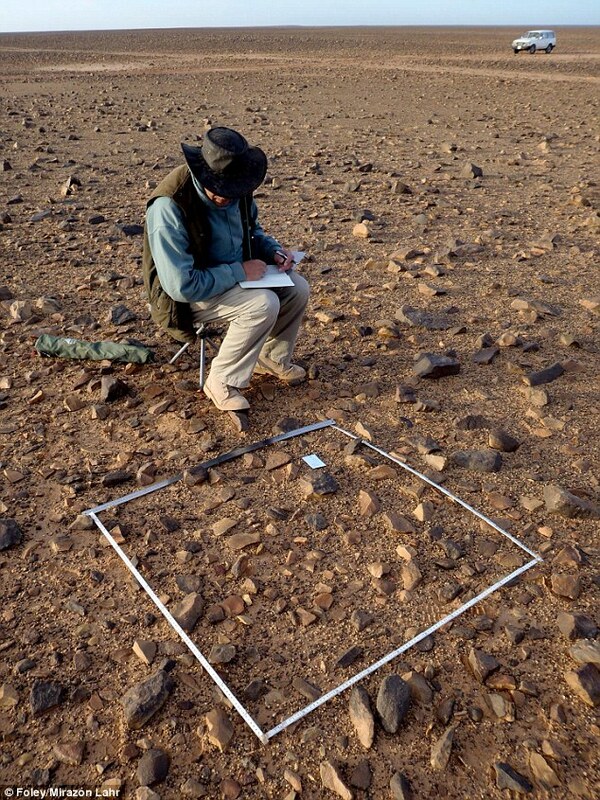 A researcher is recording artifacts from a one meter square plot in the Libya Sahara desert. Foley RA, Lahr MM (2015) Lithic Landscapes: Early Human Impact from Stone Tool Production on the Central Saharan Environment. PLoS ONE 10(3): e0116482. doi: 10.1371/journal.pone.0116482.